Click the Reminders command on the Options menu. Right-click the task tray icon and select the Reminders command from the Options submenu. Click the Reminders tab in the Options window after it has been displayed by using one of the other commands in the Options menu. 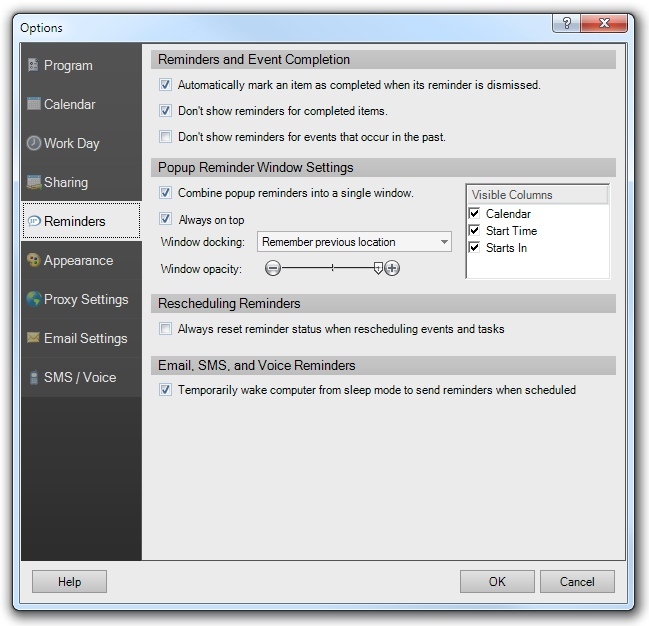 The Reminders tab of the Options Window enables you to specify VueMinder reminder options. Events and tasks can optionally be marked as completed after their associated reminder has been dismissed. Completed events and tasks will either change their appearance or be totally hidden, depending on the selections in the View Menu. You can also choose to suppress reminders for events and tasks that have been marked as completed. Events and tasks can be marked completed by right-clicking the event in the Calendar View and selecting the "Completed" option, checking the completion box in the Event List or Task List, or by opening the Event Editor or Task Editor and checking the "Completed" box. You can choose to combine all popup reminders into a single instance of the Popup Reminder Window, or display reminders individually in separate windows. The popup reminder window can be set to always display above other windows by checking the "Always on top box". The initial docking location of the popup reminder window can also be selected, or you can choose for the window to recall its previous position. The popup reminder window opacity can be adjusted using the slider. Drag the slider to the left to make the window more transparent, or to the right to make it more opaque. The columns shown in the list at the top Popup Reminder Window can be made visible or hidden using the checkboxes. Uncheck a column to make it hidden. If all boxes are unchecked, only the event or task title will be listed, with no other columns. When an event or task is rescheduled, and a reminder was previously processed, a message will appear asking if you'd like to reset the reminder so it will be processed again. If you always want the reminder status to be reset after rescheduling an event or task (without a message asking you), check the "Always reset reminder status" box. By default, VueMinder will wake the computer from sleep mode when an email, SMS, or voice message is scheduled for transmission. The computer will be returned to sleep mode one minute after the reminder is sent. This option ensures the transmission of reminders is not delayed. If you don't want the computer to wake from sleep mode to send reminders, this option can be disabled by unchecking the box labeled "Temporarily wake computer from sleep mode to send reminders when scheduled". Note, if the computer is completely powered off, this feature won't work. The computer has to be in sleep or hibernate mode. Also, the power settings must be properly configured to allow wake timers. In "Control Panel > Power Options > Change Plan Settings > Change Advanced Power Settings > Sleep > Allow Wake Timers", ensure all items are enabled. If there is no password set on your Windows account, make sure that in "Control Panel > Power Options > Change Plan Settings > Change Advanced Power Settings > Additional Settings > Require a password on wakeup", all items are disabled.